As you can imagine, it only takes a few seconds to get changed into a lovely fetching blue number. But it takes a while to make sure that Naomi is ready for surgery. So I was asked to wait just outside the change rooms, in a small hallway. 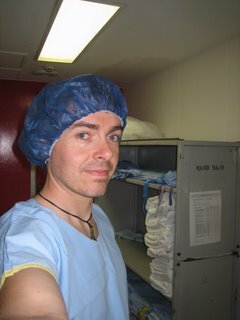 So this is me, waiting while Naomi was being prepped for the Caesarian. How 15-20 mins can feel like a few days is quite astounding! During this time I went though a whole heap of different thoughts. I hope that Naomi didn't feel like she'd failed, as I certainly didn't think so. It's just that the BB has inherited her lack of patience and wanted out. I was a little excited - knowing that the BB would soon be with us, as well as being excited about actually being there during the birth. I also thought long and hard about whether I wanted to actually watch. I had thought about this before, and when faced with it I came to the same conclusion. Although I would love to watch the procedure, and I had in fact seen quite a few on TV, it was not something that I wanted to associate with Naomi. That was a mental image that I decided I didn't need. Of course, in the 15 minutes/lifetime I had in my lonely hall, I also had my moments of fear and doubt. This was, after all, a major operation. And the BB was showing signs of distress. And where the hell was Dr Lionel and why is this all taking so long!? So... after a wait that did seem longer than the queue for Space Mountain at Disneyland, Thea came and escorted me in.